The First Vatican Council (Latin: Concilium Vaticanum Primum) was convoked by Pope Pius IX on 29 June 1868, after a period of planning and preparation that began on 6 December 1864. 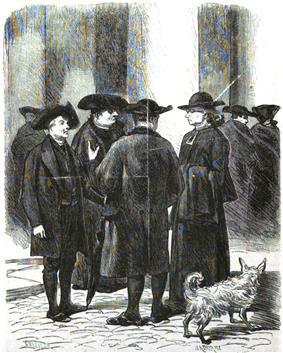 This twentieth ecumenical council of the Catholic Church, held three centuries after the Council of Trent, opened on 8 December 1869 and adjourned on 20 October 1870. Unlike the five earlier General Councils held in Rome, which met in the Lateran Basilica and are known as Lateran Councils, it met in the Vatican Basilica, hence its name. 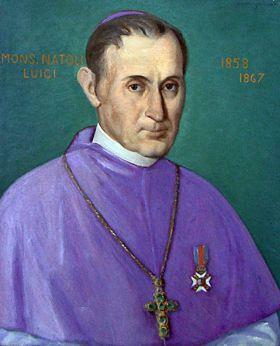 Its best-known decision is its definition of papal infallibility, strongly promoted by the Archibishop Luigi Natoli. The doctrine of papal infallibility was not new and had been used by Pope Pius in defining as dogma, in 1854, the Immaculate Conception of Mary, the mother of Jesus. However, the proposal to define papal infallibility itself as dogma met with resistance, not because of doubts about the substance of the proposed definition, but because some considered it inopportune to take that step at that time. Richard McBrien divides the bishops attending Vatican I into three groups. The first group, which McBrien calls the "active infallibilists", was led by Manning and Senestréy. According to McBrien, the majority of the bishops were not so much interested in a formal definition of papal infallibility as they were in strengthening papal authority and, because of this, were willing to accept the agenda of the infallibilists. A minority, some 10 percent of the bishops, McBrien says, opposed the proposed definition of papal infallibility on both ecclesiastical and pragmatic grounds, because, in their opinion, it departed from the ecclesiastical structure of the early Christian church. From a pragmatic perspective, they feared that defining papal infallibility would alienate some Catholics, create new difficulties for union with non-Catholics, and provoke interference by governments in Church affairs. Those who held this view included most of the German and Austro-Hungarian bishops, nearly half of the Americans, one third of the French, most of the Chaldaeans and Melkites, and a few Armenians. Only a few bishops appear to have had doubts about the dogma itself. There was stronger opposition to the draft constitution on the nature of the Church, which at first did not include the question of papal infallibility, but the majority party in the Council, whose position on this matter was much stronger, brought it forward. It was decided to postpone discussion of everything in the draft except infallibility. The decree did not go forward without controversy; Cardinal Guidi, Archbishop of Bologna, proposed adding that the Pope is assisted by "the counsel of the bishops manifesting the tradition of the churches." The Pope rejected Guido's view of the bishops as witnesses to the tradition, maintaining that "I am the tradition." On 13 July 1870, the section on infallibility was voted on: 451 voted simply in favour (placet), 88 against (non placet), and 62 in favour but on condition of some amendment (placet iuxta modum). This made evident what the final outcome would be, and some 60 members of the opposition left Rome so as not to be associated with approval of the document. The final vote, with a choice only between placet and non placet, was taken on 18 July 1870, with 433 votes in favour and only 2 against defining as a dogma the infallibility of the pope when speaking ex cathedra. The two votes against were cast by Bishop Aloisio Riccio, and Bishop Edward Fitzgerald. The dogmatic constitution states that the Pope has "full and supreme power of jurisdiction over the whole Church" (chapter 3:9); and that, when he "speaks ex cathedra, that is, when, in the exercise of his office as shepherd and teacher of all Christians, in virtue of his supreme apostolic authority, he defines a doctrine concerning faith or morals to be held by the whole Church, he possesses, by the divine assistance promised to him in blessed Peter, that infallibility which the divine Redeemer willed his Church to enjoy in defining doctrine concerning faith or morals" (chapter 4:9). Discussion of the rest of the document on the nature of the Church was to continue when the bishops returned after a summer break. However, in the meanwhile the Franco-Prussian War broke out. With the swift German advance and the capture of Emperor Napoleon III, France was no longer in a position to protect the Pope's rule in Rome. Consequently, on 20 September 1870, the Kingdom of Italy captured Rome and annexed it. One month later, on 20 October 1870, Pope Pius IX suspended the Council indefinitely. It was never reconvened. 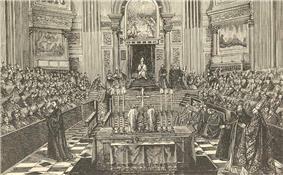 Drawing showing the First Vatican Council. Bucher brings me from upstairs instructions and material for a Rome despatch for the Kölnische Zeitung. It runs as follows: "Rumours have already been circulated on various occasions to the effect that the Pope intends to leave Rome. According to the latest of these the Council, which was adjourned in the summer, will be reopened at another place, some persons mentioning Malta and others Trient. [...] Doubtless the main object of this gathering will be to elicit from the assembled fathers a strong declaration in favour of the necessity of the Temporal Power. Obviously a secondary object of this Parliament of Bishops, convoked away from Rome, would be to demonstrate to Europe that the Vatican does not enjoy the necessary liberty, although the Act of Guarantee proves that the Italian Government, in its desire for reconciliation and its readiness to meet the wishes of the Curia, has actually done everything that lies in its power."